You may need to unmatch a constituent from a social connection because they've been matched incorrectly. 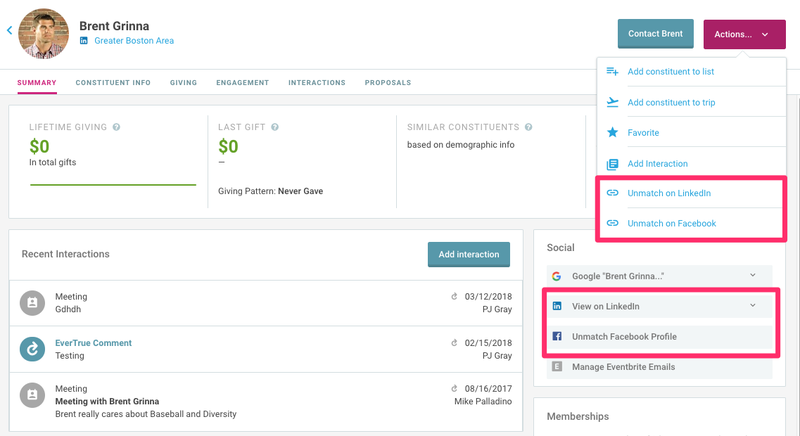 To do this, on any matched constituent profile you will see the option to un-match the constituent (from either LinkedIn or Facebook) in the "Actions" dropdown menu. Additionally, in the Social section of the Summary tab, you will see the options to unmatch. For Facebook, the 'Unmatch on Facebook' option will be immediately available. Facebook matches are done on a per page basis, which means you will similarly unmatch a constituent from Facebook on a per page basis. Because of this, we recommend you treat each Facebook page match as it's own unique connection and evaluate every match independently of any others that have been made to a different page. For LinkedIn, click on the drop-down arrow next to 'View on LinkedIn' to open up a menu with the option to "Unmatch on LinkedIn." Once a constituent has been unmatched from a social connection, EverTrue will never automatically re-match them to that same profile or page. However, we may attempt to re-match the constituent to another LinkedIn profile if a new email is recognized. Additionally, any new or previous manual match can be made. These matches will stay intact even after a data import. For information on how to match or re-match, click here for LinkedIn and here for Facebook!